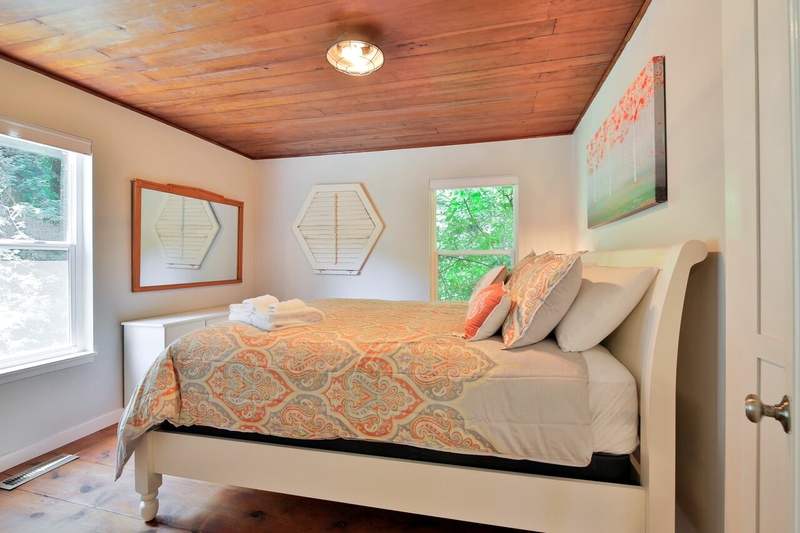 15% off 2 nights thru APRIL, 3 Nights for the Price of 2, SPRING RATES to May 20th, All Holidays Excluded! 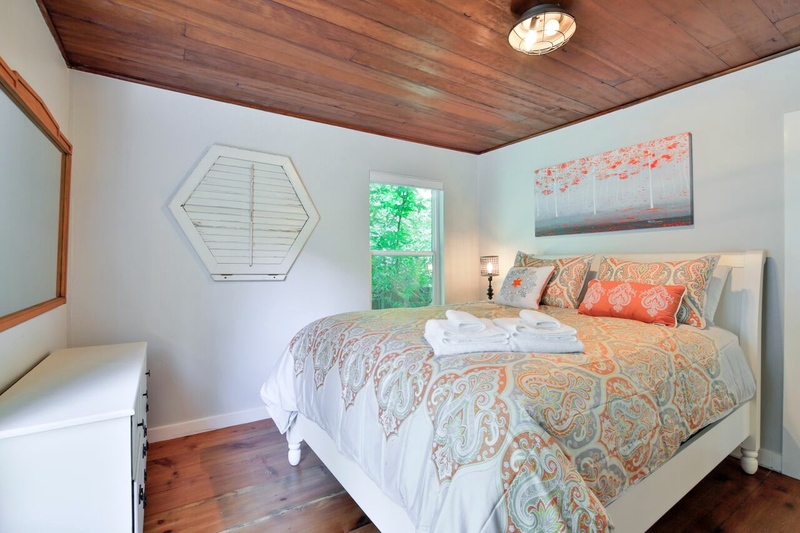 Maristella's Treehouse is a newly renovated home that was meticulously designed to offer full relaxation, amenities and comfort to singles/couples as well as families looking for a fun weekend getaway. 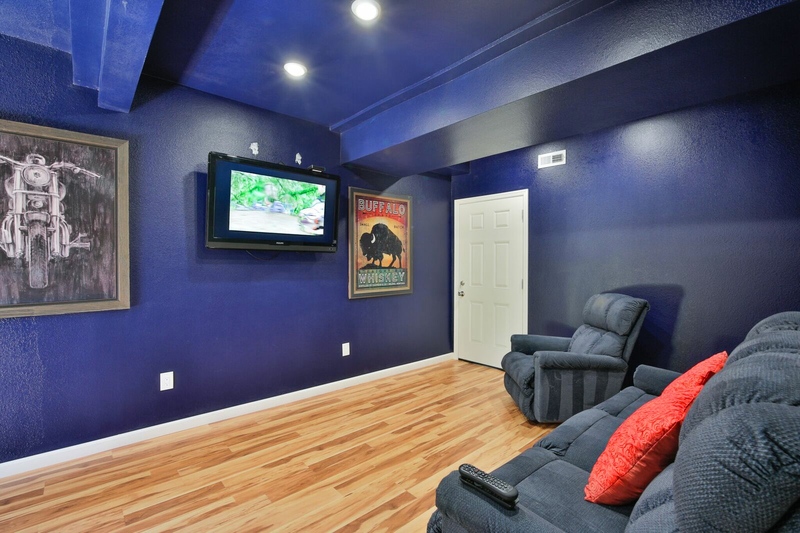 The house features 3 bedrooms plus separate man cave / game room, 2.5 baths, spa tub for six adults, large lounging deck and private outdoor space. 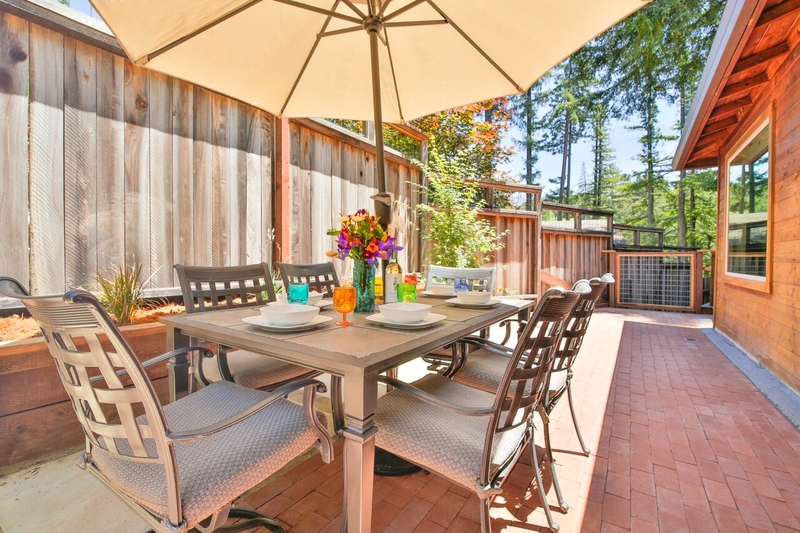 If you love the outdoors, it is located near the Russian River, a one-minute walk to the gorgeous Northwood Golf Course, approximately a mile from hiking/biking trails at Armstrong Woods, and a quick drive to some beautiful beaches and boutique wineries! If you want to land in the Heart of the Russian River Wine Valley in have arrived! The kitchen is large and stocked with everything you need to create great meals, including a fully stocked spice rack to inspire the chefs in your group. The dining room seats eight and is adjacent to the kitchen so no one is left out! 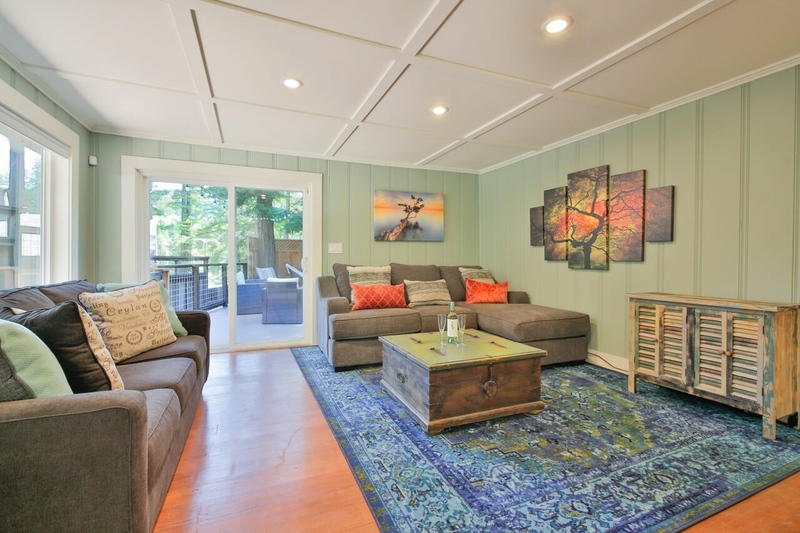 The living room provides easy access to the large deck. 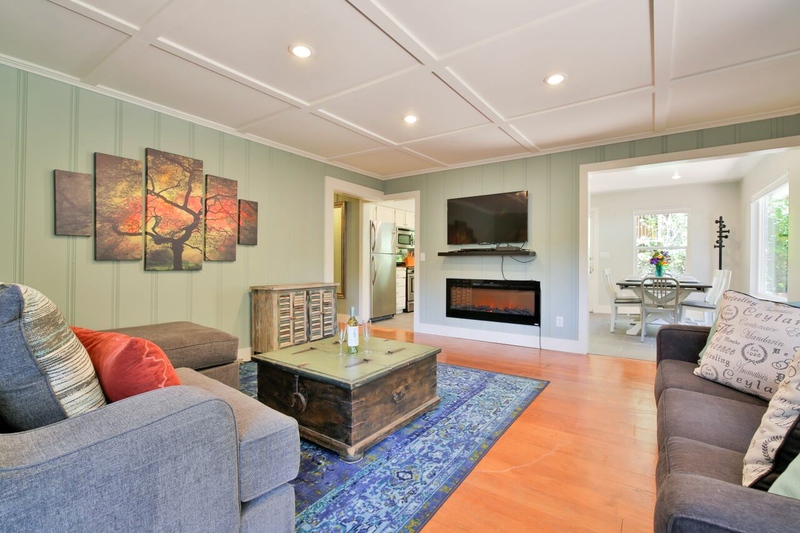 It offers an entertainment unit featuring a flat screen Smart TV that includes Netflix and cable, DVD player, Bluetooth speaker so you can stream your own playlist, cozy electric fireplace, comfortable seating and a queen sofa sleeper. 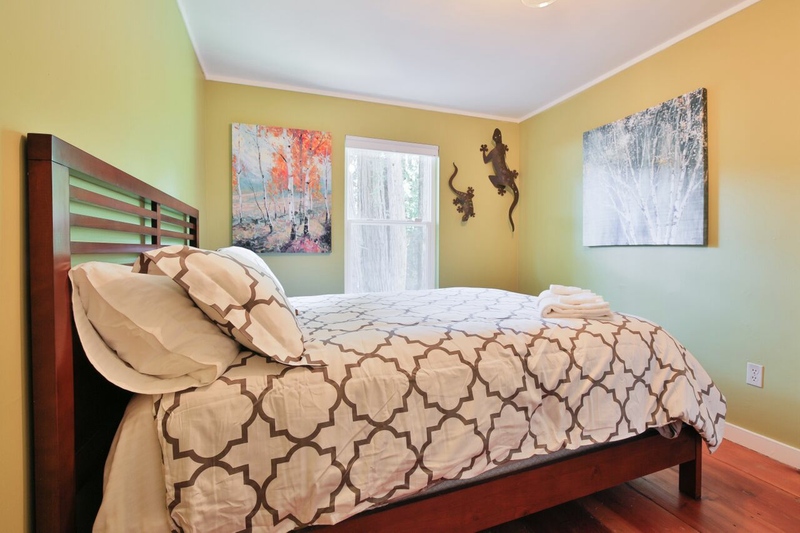 Three spacious bedrooms feature forest views and queen beds carrying top-of-the-line mattresses and pillows. The master bedroom has a flat screen TV and private half bathroom. Each bedroom offers child-safe Bali privacy shades, generous lighting, storage, and alarm clocks with charging ports for your favorite digital devices. 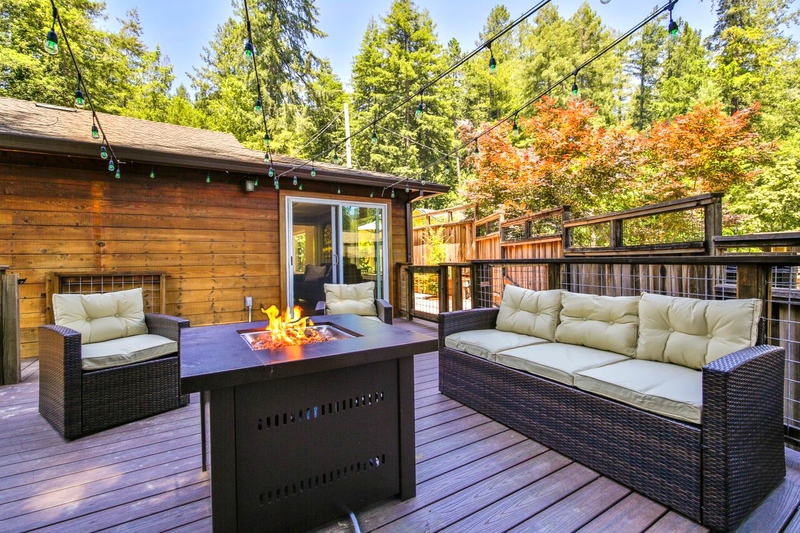 Walk down a short, outdoor staircase and find yourself in a private game room that boasts a 4-player ping pong table, flat screen TV, smart DVD player featuring Netflix, a DVD library, the latest Xbox One S bundled with Minecraft, and board games. 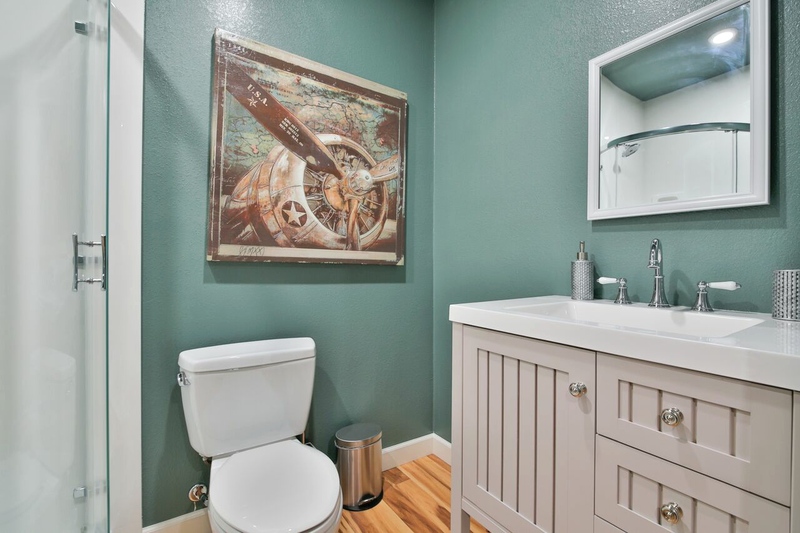 This room also has a full bathroom. The outside is as inviting as the inside. 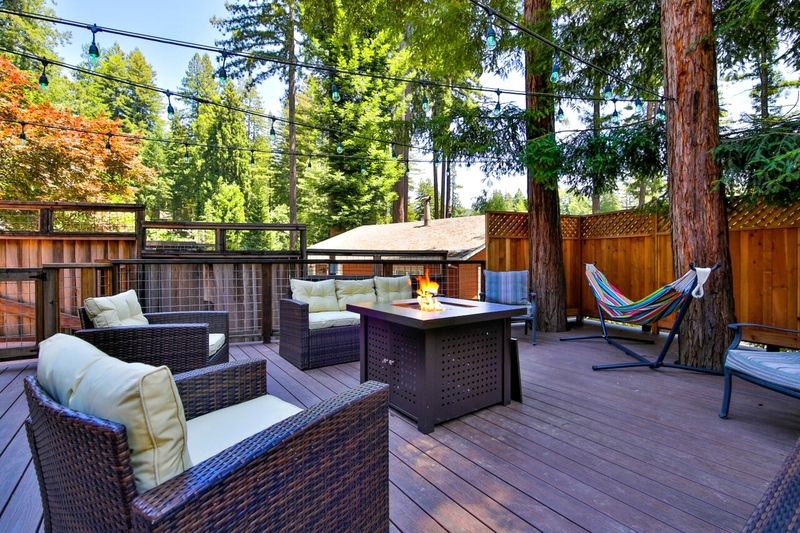 Tall Redwood trees surround the large deck that is fully furnished with a gas fire table, hammock and several lounging chairs. It is the perfect place to relax, and even peaceful to work from as you take in your beautiful surroundings. The side patio has a large dining area and gas BBQ with a built-in rotisserie rack should you wish to BBQ a whole chicken! 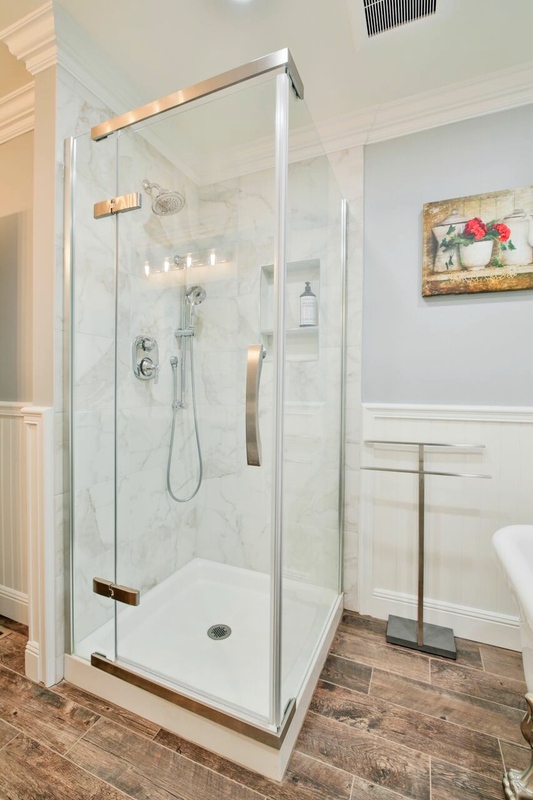 To help maximize your comfort, the space has been enclosed and designed for privacy so your fur and human babies can safely play while you relax. This really is the house you'll tell your friends and family about! AVAILABLE UPON REQUEST For your convenience, the following items can be made available for your use: beach chairs, cooler, pack n’ play, child dining booster chair, diaper changing pad. Friendly reminder 8 people max day or night. Free Wifi. 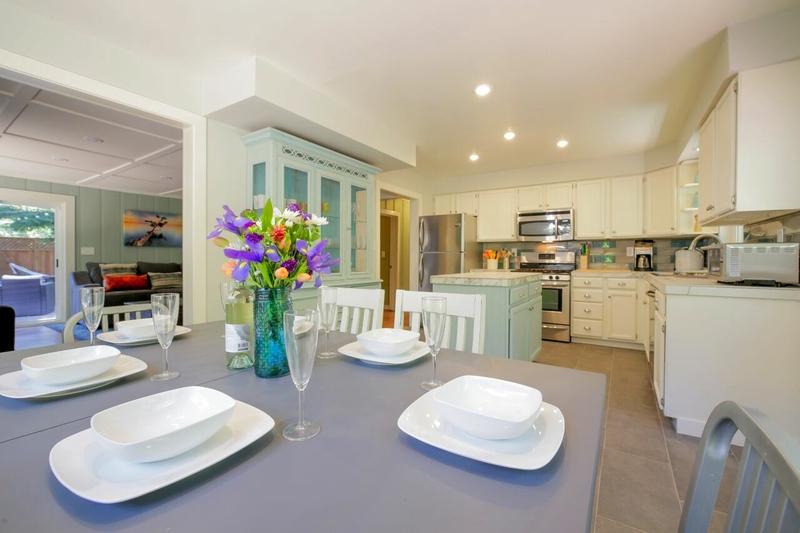 Manager response on 2019-03-28 - Response from Dillon Beach Property Management, Inc. The rental was as pictured and advertised. 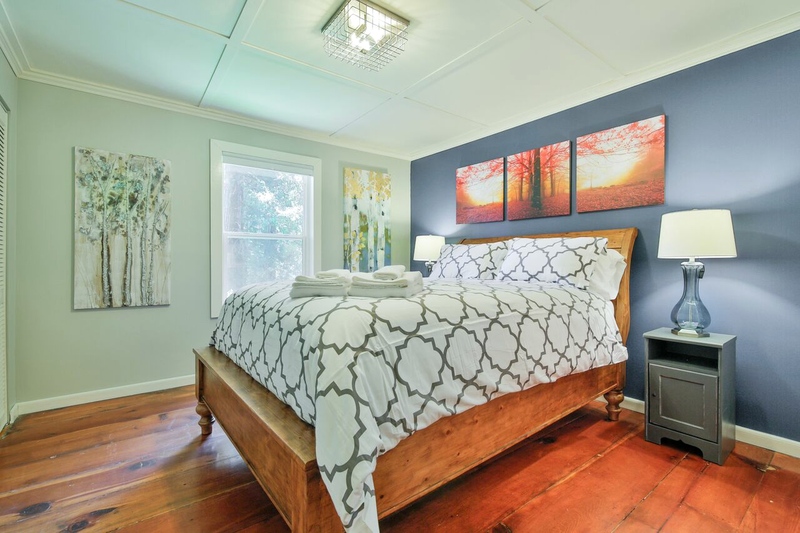 Three couples were happy with the amenities and location. Great rental for friends and family. Came to California for a family vacation, chose this house based on the location and style and was not disappointed! Perfect place to get away along the Russian River, escape up Hwy 1 for amazing sights, and then go enjoy some wine country. All of these are short drives away. House was exactly as advertised and perfect for our stay. Manager response on 2018-11-05 - Response from Dillon Beach Property Management, Inc.
Beautiful town and neighborhood. Loved the redwood forest right around the corner. Wish we could have golfed but the rain was much needed. Hot tub was very nice. Property manager very responsive. Manager response on 2018-11-25 - Response from Dillon Beach Property Management, Inc. This was the first time we stayed in a house for our annual Wine Girls Trip and it was perfect. The fully outfitted kitchen allowed us to prepare breakfast and dinner after obtaining supplies from the local Safeway. The house was immaculate, the beds comfortable, water temperature/pressure relaxing. I know if the outside temperature wasn’t in the 30’s in the evening we would have enjoyed the hot tub and deck with the fire pit. It’s nice there was the option to drop off at the front door for those of us with lots of wine instead of hauling everything up the stairs from the parking spot.The setting was beautiful and tranquil in November, us city girls loved the quite time. It takes about 30 minutes to get to the closest winery but that’s the payoff for the quite, small town environment. After a few days we were more familiar with the dark, windy roads at night. I would definitely return for another stay at Maristella’s Trrehouse if exploring Sonoma in the future. Manager response on 2018-11-16 - Response from Dillon Beach Property Management, Inc. Manager response on 2018-09-12 - Response from Dillon Beach Property Management, Inc.
Our family of 5 had a lovely time here! House was perfect, everything was beautiful and accessible. So many lovely details went into the home. (Quick tip- be careful not to to lock yourself out of the first bedroom, this is how we learned how nice and responsive the management would be.) Lots of reminders to respect the rules and stay quiet, however that may be why we were able to enjoy the quiet ourselves. Loved every minute there! Enjoyed returning after kayaking and adventuring! 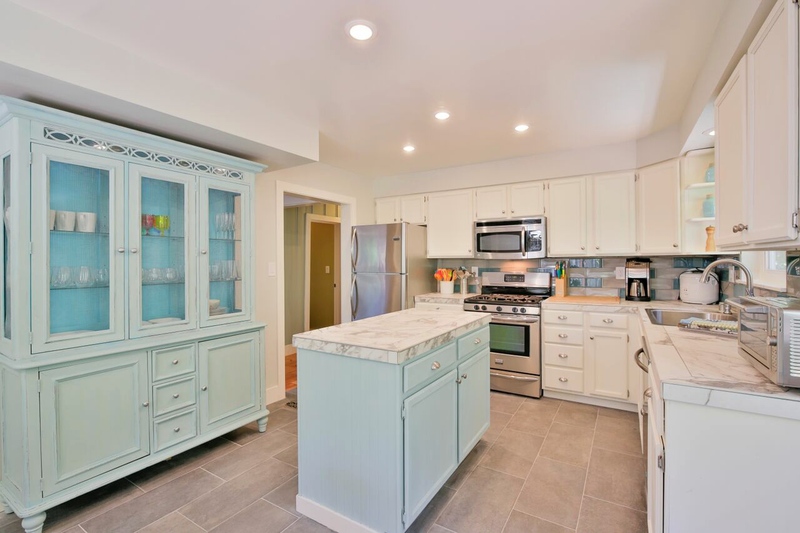 Extraordinary kitchen- everything a chef needs! We will return! twice at a nice restaurant across the street. We all enjoyed the hot tub and the fireplace on the patio. Kids enjoyed the game room. Parking wasn't so easy. Manager response on 2018-08-10 - Response from Dillon Beach Property Management, Inc.
Our stay really did feel like we were up in the trees! 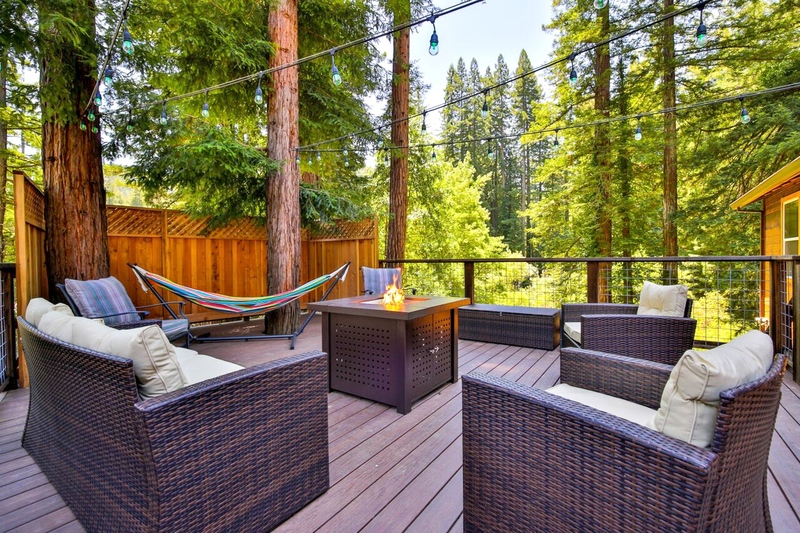 The deck is high up and is surrounded by beautiful pines and redwoods. There is a fire pit and hot tub. The inside is roomy and very comfy. Very clean and fresh. Communication and house instructions were easy and swift. Highly recommend this outdoorsy home. And close to Guerneville, Monte Rio and the Sonoma Coast, too! This was a great trip for us and our grandkids. The house was in a convenient location. 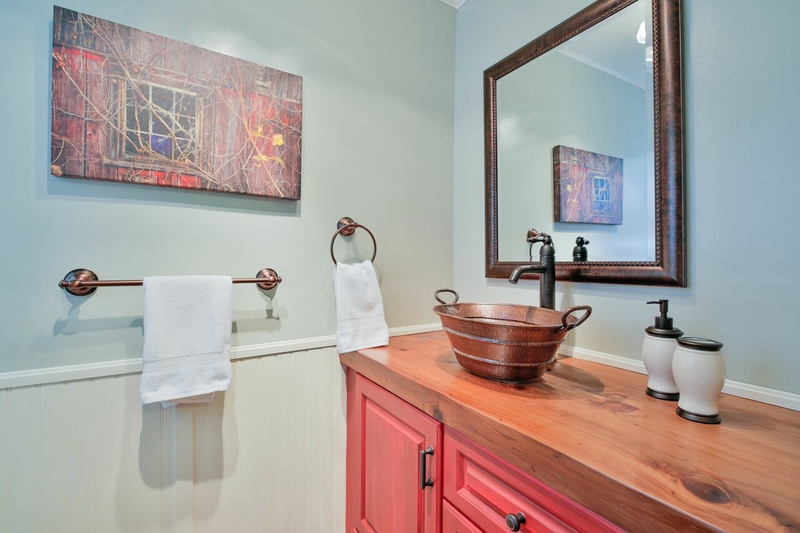 The best thing was the overall condition and cleaniness of the house. No comlaints. Everything was lovely. Wish the check out was closer to 12:30ish instead of 11:00am. My only constructive feedback.. Everything was fantastic! Manager response on 2018-10-16 - Response from Dillon Beach Property Management, Inc.
Our family of 7 adults stayed here for long Thanksgiving weekend. Communications were good and well organized. Beds were comfortable. Kitchen was well stocked to cook Thanksgiving dinner. Wish the room downstairs had a sleeper sofa. Would have been more comfortable. Fan in downstairs bath was on at t all times when someone was downstairs. It was loud and kept us awake in one room. Manager response on 2017-12-31 - Response from Dillon Beach Property Management, Inc. If you are thinking of staying at Maristella's Treehouse, book it! We just returned from a 3 night stay and the Treehouse looks just like the pictures only better. It is homey and inviting and the decor lovely. The kitchen is well stocked and easy to work in. The owners are quick to respond to questions and very helpful. We really enjoyed our time here and would definitely stay again. Manager response on 2017-11-08 - Response from Dillon Beach Property Management, Inc.
We loved our stay at Mariatella’s treehouse and would highly recommend. The rooms were cozy, the kitchen was beautiful and the living room was comfy and provided enough space for all 8 of us. The downstairs game room also acted as additional bedroom which was terrific!! Val at Dillon Beach Property was a huge help and answered all of my questions. Hope we have an opportunity to stay here again! Manager response on 2018-05-01 - Response from Dillon Beach Property Management, Inc. 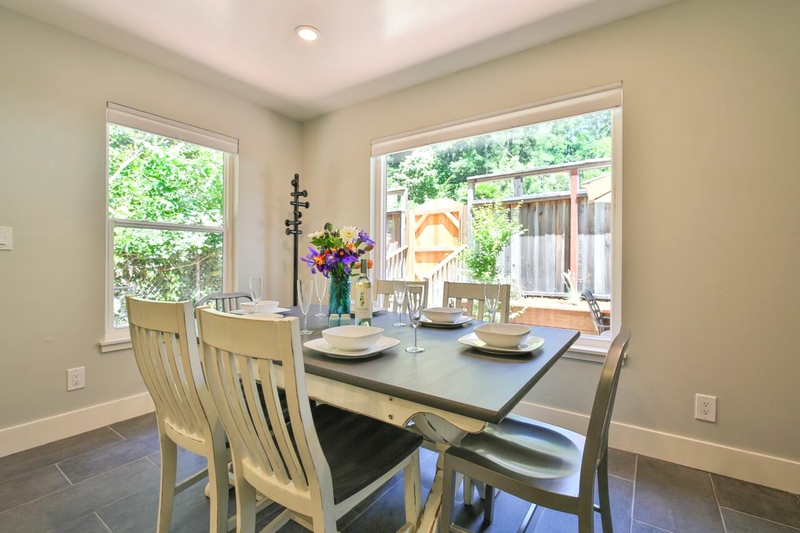 I always know I can trust Russian River Escapes to provide me with the perfect house when I need a relaxing weekend getaway. Maristella's Treehouse is a wonderful place to make a big dinner (in the well-stocked kitchen) and hang out with friends/family. I brought my mom and aunt up here to celebrate my mom's retirement. My aunt said it best "The only problem with this house is that I'm going to have to leave." Manager response on 2018-02-25 - Response from Dillon Beach Property Management, Inc. Manager response on 2018-03-24 - Response from Dillon Beach Property Management, Inc.
Glad you had a sweet stay! 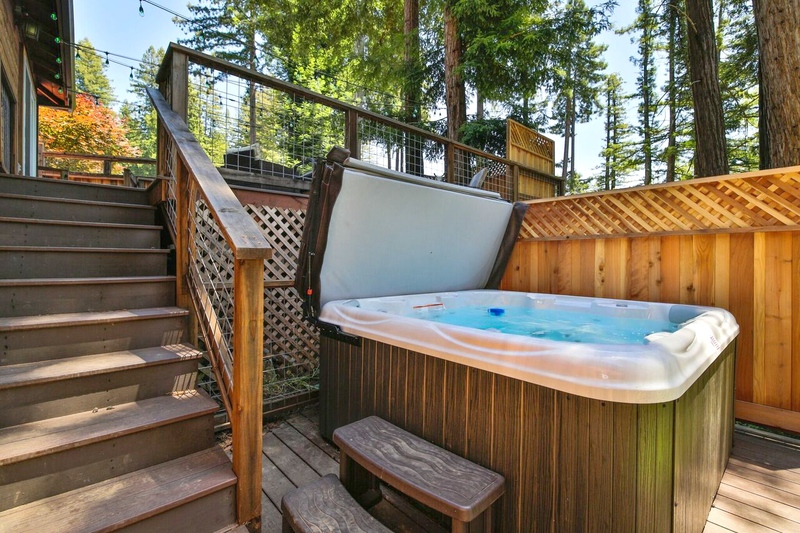 This 3 bedroom, nicely appointed house has a fenced-in deck and hot tub, providing a nearly perfect setting for a long weekend with 2 couples. The place was spotless and had everything we needed (corkscrew, salt and paper, ice cubes) exceeding our expectations by far. Similar to other places in Guerneville and Forestville, parking is something of an adventure (a very narrow dirt road surrounded by huge redwoods is provided for parking), but you become accustomed to dealing with it fairly quickly. Moving 2 cars in and out is tricky. Dropping off suitcases and groceries from the upper road is also a bit hairy (backing up all the way to get out). 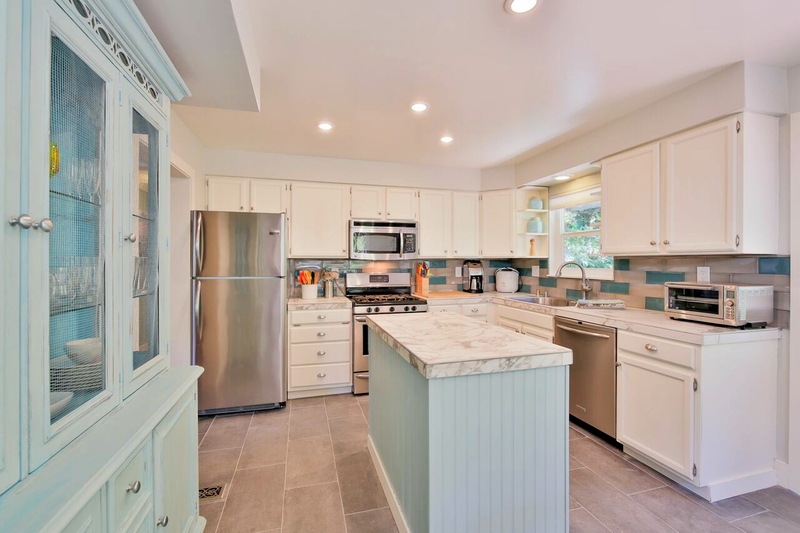 Everything--floors, counters, bedding seem quite new and very high quality. For example, the windows/walls are so well insulated that you hear absolutely no noise from the closeby River Road. Entry by door code was seamless. Hosts left a detailed set of instructions, which was welcomed (and not all that common). The "2.5 bathroom" description is a little misleading - with a bathroom (and a large game room) actually in another separate apartment/level with its own entrance. 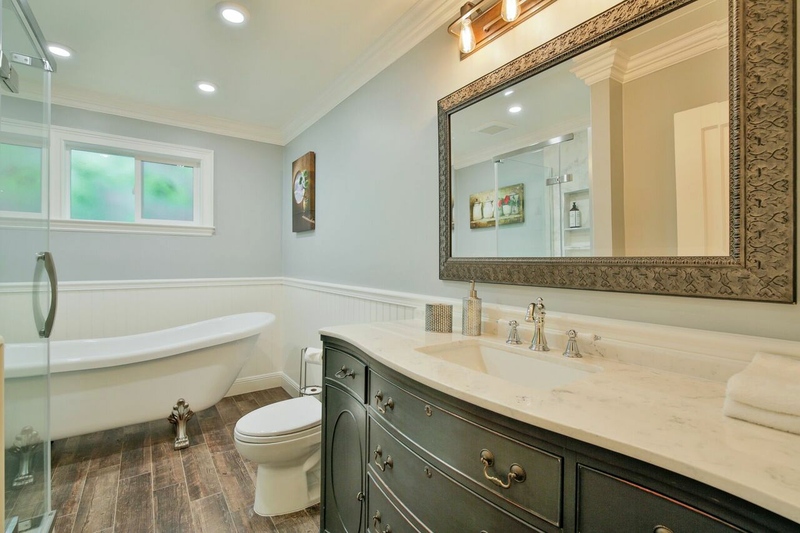 So, on one floor, just 1.5 baths (the .5 is off one master bedroom). 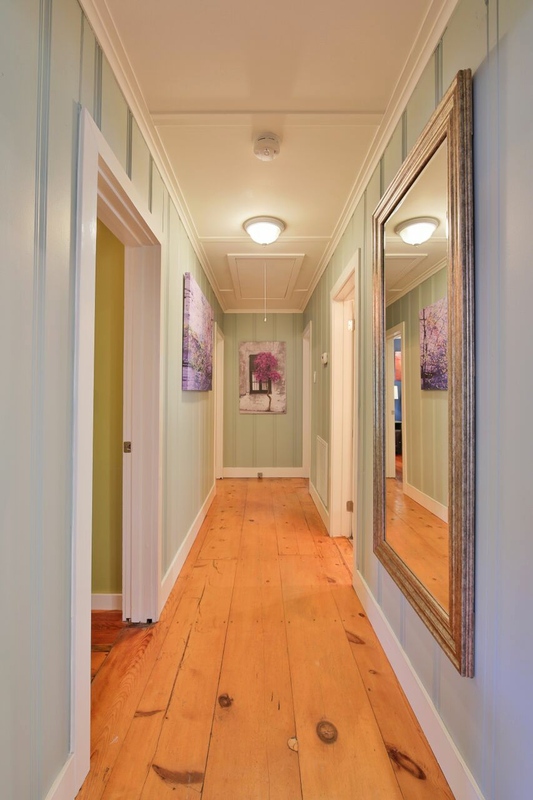 The place is charming and the broad plank wood floors will knock you out. 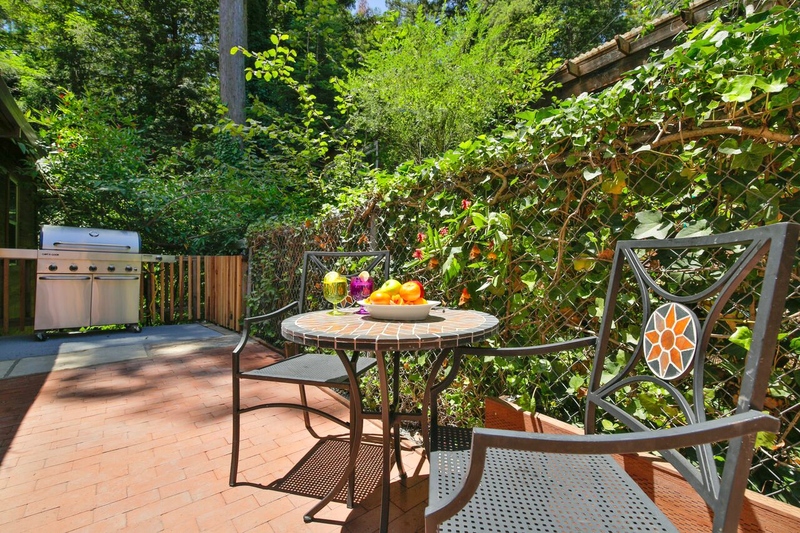 So will the town of Guerneville. Wonderful stay at Maristella's Treehouse! The house is beautifully decorated. Everything you need is provided. It is a great location close to downtown but far enough that you avoid the craziness. Only thing to be aware of is the parking situation. The neighbors are very protective and are not happy to have a short term rental nearby. Parking is on the back side of the house. Manager response on 2018-06-13 - Response from Dillon Beach Property Management, Inc.